PEOPLE often ask me how they can begin to integrate better horsemanship skills into their dressage work, particularly when it comes to riding required movements for competition. In dressage, the most basic movements are fairly complex because of the degree of alignment and balance required in their execution. This means that the horse must respond to several aids at once, coordinating various parts of its body in a unified way. If a dressage movement is introduced unskillfully, confusion ensues - a confusion that can be avoided by initially breaking the exercise down into a simpler form. In this way, the horse is given a chance to understand how to comply to just one aid at a time before being asked to decipher multiple directives given simultaneously. Understanding the various aspects of an exercise also allows the person to better understand the building blocks of the more complex dressage movements, their benefits and their purpose. It's easy to forget that the original intent for the movements we try to achieve in competition had nothing to do with amassing ribbons and high test scores, but were designed to enable the horse to respond to the person as a highly maneuverable athlete through a system that could teach the human how to better communicate with the horse. It's important for us to realize that we need the time to practice and learn how to communicate what we often expect our horses to do automatically. Any time we can break something down to it's lowest common component, we greatly reduce unreasonable expectations, confusion and irritation in ourselves, and resistance in our horses. The better we understand what we're asking our horse to do, the more easily our horsemanship skills can be developed. One basic training movement in dressage is called the "turn on the forehand," executed at the walk. The horse faces toward the center of a circle. 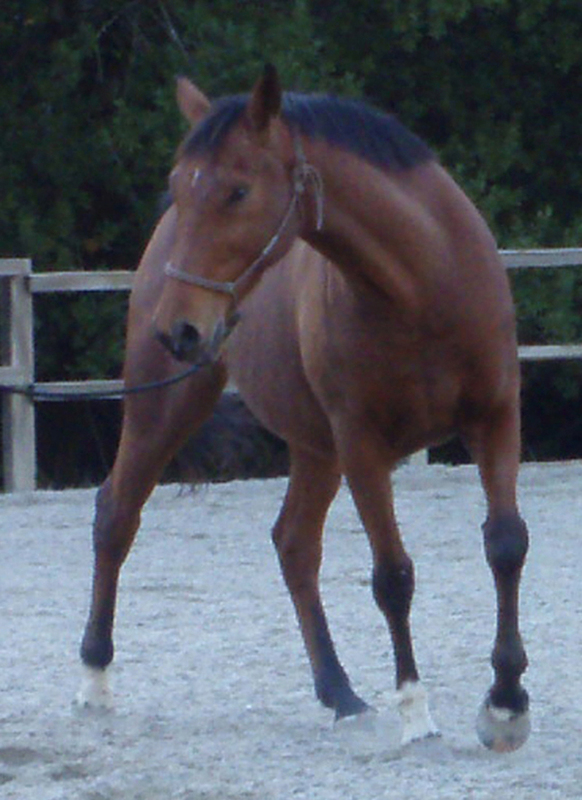 The front feet take smaller steps, almost in place but keeping a definite walk rhythm as if maneuvering around a dinner plate, while the hindquarters yield laterally (via a crossing and uncrossing action of the hind legs), taking broad, sweeping steps and making a wider circle around the front end (see illustration to the right). The horse's head and neck are mildly flexed toward the inside, or away from the direction the hindquarters are moving. The walk remains active and energetic. According to the German handbook of training, Advanced Techniques of Riding, the turn on the forehand, or "the turn around the forehand in motion," was developed by the Duke of Newcastle in the 17th century. "This exercise taught the horse, once he had submitted to the one-sided inside aids, to seek and accept the outside aids. This is the first step towards straightening the horse on curved and straight lines. It also prepares the horse for the collecting movement of shoulder-in, which is the foundation of all other lateral movements." While this exercise is often practiced at a stand-still, it has the greatest gymnastic benefit when executed with forward motion for reasons that will be discussed throughout this article. Because our horse must coordinate various parts of its body in order to respond to multiple aids given simultaneously, thus executing the turn on the forehand seamlessly, preparation is key. Once the parts are understood, the complete exercise becomes easier to communicate and has a better chance of being used to greater benefit. The turn on the forehand is not required for dressage competition but is the basis for every subsequent movement because it educates both horse and rider to the meaning behind the rider's weight and placement of the seat bones, the inside rein, the inside leg, the outside rein, and the outside leg. Each one of these aids is synchronized together to produce the movement, yet each requires it's own response from the horse. The counterpart to the turn on the forehand in horsemanship circles is often referred to as "disengaging the hindquarters," also a lateral yielding of the hindquarters via a crossing and uncrossing action of the hind legs. In dressage-speak, the term "disengaging the hindquarters" is a misnomer because the action of crossing the hind legs actually allows the horse to step farther up underneath the belly with the inside hind leg, thus developing its ability to load more weight on the rear end for collection and engagement - or carrying power - later on. But the word "disengage" can also mean "to loosen," which appropriately describes the fundamental purpose of both exercises. More important than its name, disengaging the hindquarters can be used as a building block to the turn on the forehand because it is executed in a less complicated manner, and can be tailored to match the level of experience in both horse and rider. All that is required to begin is a forward walk and a lead line (if conducted from the ground) or one rein (if conducted from the saddle). Both "disengaging the hindquarters" and the turn on the forehand place the bulk of the horse's weight on the forehand, freeing the hind end to move laterally, or sideways, more easily. This might sound counterintuitive to preparing our horse for collection and engagement, but in order to strengthen muscles properly for collection, they must first be suppled and free of tension to allow for adequate blood flow and coordination which leads to greater potential in movement. We often assume that horses naturally know where to place their feet in order to do whatever we might ask of them. But horses are subject to the same asymmetries, tight muscles and weaknesses that we are. Like us they tend to have a strong side and a weak side which they have gotten into a pattern of compensating for, and what they do easily in one direction, they might struggle with in the other. The crossing and uncrossing action of the hind legs supples the hindquarters by stretching and flexing the various muscles, ligaments, tendons and joints throughout. This is the first phase of preparing the rear end for strengthening later on. (A horse whose hindquarters have not been adequately strengthened will merely use tension to compensate for his weakness when we ask him to collect his body and carry more weight toward the rear). It is not the purpose of this article to go into technical detail about each body part and it's specific name and function (some great anatomy charts can be found online), but it is not difficult to understand how each body part is generally affected by performing the turn on the forehand. For example, when the legs are crossed, the muscles and soft tissue on the outside of each leg must stretch (the equivalent of our abductors). When uncrossed, they are stepping wide and stretching the muscles and soft tissue on the inside (adductors). Crossing and uncrossing the hind legs also loosens the joints and stretches the various muscles that run up and down the back side of the rump, down to the hocks (hamstrings). During the crossing phase, the inside hind leg must step in front of the outside hind leg in both the turn on the forehand and when disengaging the hindquarters in order to be effective (the "inside leg" is the leg facing the direction the horse's head and neck are flexed toward). In Figure 1 above, the "inside" is the left side. In Figures 2 and 3 below, the "inside" is the horse's right side. ~ The hindquarters are the driving force behind a horse's movement. Any stiffness or bracing in the rear will impede their ability to move and respond comfortably and softly in a coordinated fashion. Horses who are supple and responsive are more comfortable in their own skin while being pleasant and safer to ride. Such horses tend to have fewer injuries while maintaining a positive attitude toward their work. ~ Channeling a horse's excess energy into a circle in a way that elicits a crossing action of the hind legs can avert what could turn into a dangerous buck, kick, or runaway by diffusing their ability and desire for resistance. ~ In order to make a simple turn, the hindquarters must be unbraced to follow the front end in a fluid and synchronized fashion. If this is not the case, the head and neck can be turned in one direction while the outside shoulder "falls out " or "sags, " pulling the horse in the opposite direction (sometimes referred to as rubber-necking). 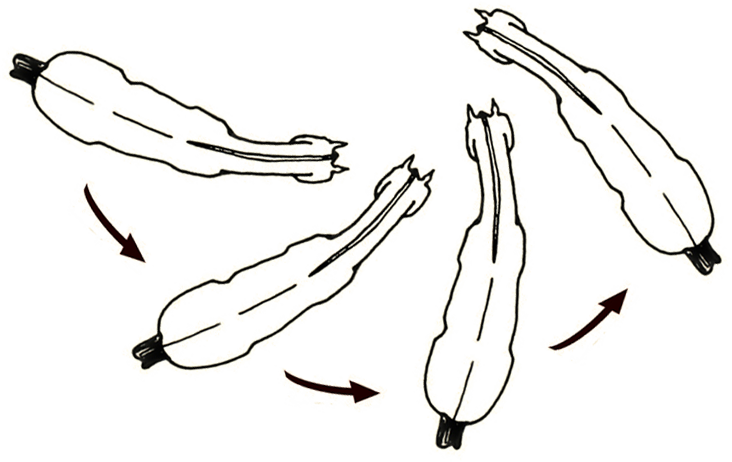 Although it feels like the stiffness is in the shoulders, it is more likely that the horse isn't stepping through with the inside hind leg in order to allow the full length of the horse's body line up with the shoulders (see figures 2 and 3 below). The first picture above shows a horse being asked to turn in toward the center of the circle using a simple halter and lead. You can see that the head is yielding to the draw on the line, but the shoulders are "stuck" or falling out toward the outside. 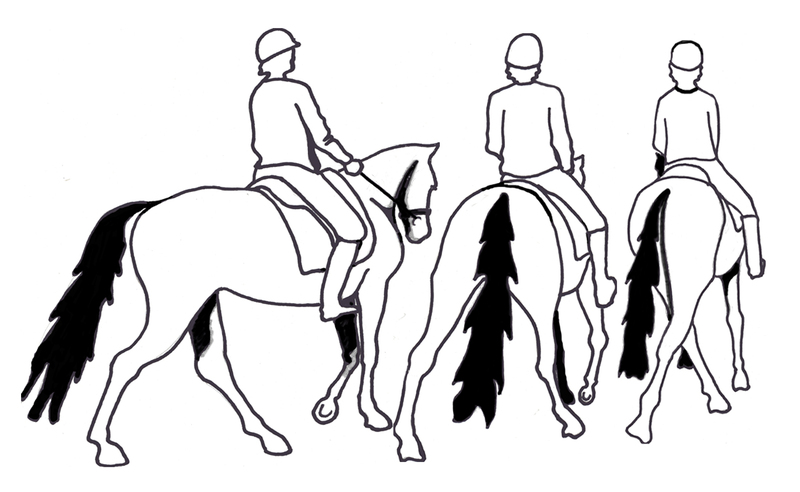 Figure 3 to the right shows the hindquarters yielding as the inside hind leg crosses in front of the outside hind leg. As a result, the horse aligns his body, enabling himself to make the turn easily. Note also how relaxation over the top line ensues, shown by a lower carriage in the head and neck, indicating relaxation of the back as well. Longitudinal suppleness (over the top line) is often achieved through lateral suppleness (side to side). True suppleness in the hindquarters is crucial to obtaining real softness throughout the front end, and often more difficult to achieve. But unless a person has felt the difference in a horse who has gone from being braced in the rear to being loose, it can be difficult to convey this idea with words, or to convince the reader of the importance of the exercises described here. ~Sitting on a carpet or padded floor, stretch your legs straight out to each side until you feel a mild pull on your inner thighs. If you're already limber and can't feel the muscles stretching, place both palms face down on the floor directly behind your thighs. Keeping your heels on the floor, gently push your torso up off the floor and then forward with your hands before easing your seat back down into a sitting position. That should widen the angle of your legs. Repeat until you feel a stretch. ~While on the floor, cross your legs. Lift your right knee into a vertical position, then lift your right foot over your left thigh and set it back down on the floor to the outside of your thigh at your knee. With elbows pointing out to each side, hug your right knee toward your chest with both hands until you feel a mild pull along the outside of your right thigh. If you're already limber and can't feel a stretch in your outer thigh muscle, bow your head down. You can then do the same with the other leg. You might notice you have one side that pulls more than another, and one side that's more flexible. You also might hear your back "pop" or "crack" as your vertebrae realign. Consider that something similar might be happening with the horse as they loosen their muscles and joints as well. ~Standing up straight, bend over and reach your arms toward your toes until you feel a pull down the backs of your upper thighs (be sure to bend your knees when you come back up). These are the muscles a horse stretches when asked to stride a hind leg forward. When a horse steps sideways while still moving forward, these "hamstring" muscles will stretch as well as the muscles that correspond to your inner and outer thighs. Of course there are surrounding muscles, ligaments, tendons, joints and sheaths that are also affected. One of the easiest ways (albeit not the only way) to begin asking a horse to cross its hind legs is by leading him in a small circle from the ground. In this case, leading is done from out in front of your horse at the end of a 12' (approx.) lead line as opposed to leading him by the shoulder. Begin by walking actively in a small to mid-sized circle (10-15m). When your horse is following at a lively walk, begin to tighten the circle, moving toward your horse's tail and watching his hind legs as you do so. The smaller the circle, the wider and more accentuated the crossing action will be. But too small a circle will inhibit your horse's forward movement, dampening his willingness to respond and inhibiting the suppling process. A lack of forward will also cause the the inside hind leg to merely step toward or cross behind the outside leg, creating incoordination and tension. To counteract this, enlarge the circle to give your horse more room to move forward while stepping wide and crossing. Finding the right balance between turning and giving your horse room to go forward is key to achieving the optimal crossing action with minimal loss of energy. It will quickly become apparent that if your horse does not respond easily to a soft directive to move forward with energy, the exercise will become sticky. If this is the case, take the time to get an active response to a light request. It will make everything you do with your horse simpler and more harmonious. The same considerations apply in the saddle. While the horse is walking forward, the rider weights their inside seat bone and draws on the inside rein to initiate a turn into a circle. Sitting to the inside encourages the horse to step under themselves with their inside hind leg in order to support and carry the rider's weight, as opposed to stepping more to the outside with the outside leg if the rider were weighting their outside seat bone. Both seat bones can influence the horse to step sideways, but for different reasons. In this case we are looking to strengthen the inside hindquarter in preparation for collected movements later on that require specific alignment and balance. By initiating the inside hind leg to cross diagonally underneath the belly and support the rider's weight, we are building agility, muscle and strength (carrying power) primarily in that leg. Although pressure may initially need to be applied to the rope or rein if one is trying to turn a very stiff horse, it is important to release that pressure by yielding the hand with each crossing action (see figures 1 and 2) of the hind legs. If the release is well-timed, your horse will become lighter and lighter in the hand as they figure out that yielding their hindquarters to the pressure of the rein will bring them relief from that pressure. The release of the inside rein is also key to not blocking the inside hind leg from stepping up and under their belly. At this stage, the rider's leg can be used to keep their horse walking forward in the turn, but not to push the hindquarters sideways. This ensures that the horse understands how to move forward off the leg first, while yielding sideways with the hindquarters in response to the rein. As mentioned earlier, this is a building block to a more complex exercise. It does not mean that the leg is never used for moving a horse sideways in this movement or any other lateral movement. It does acknowledge that in the beginning, poorly timed, multiple directives of the leg, given before the horse has learned to separate out the different meanings it can have, only serves to confuse and dull their response, particularly with a novice rider or a rider new to this exercise. Spending time ensuring that the horse understands how to yield to the rein also allows the rider to learn how soft their horse can be, and how little pressure, if any, is actually needed to establish and maintain a solid connection. "Connection" or "contact" is often confused with "poundage." But a horse that is receptive enough to yield a hind foot in response to a corresponding rein must be soft through their entire body. Any holding of tightness anywhere from the mouth to the hind foot will block their response to one degree or another, making them feel unnecessarily heavy or slow. Keeping the horse moving forward while taking lateral steps is key to eliciting a greater degree of suppleness than, for example, practicing this same exercise at a standstill, although there are other reasons for doing it that way as well. Sometimes maneuvering steps from a standstill gives the rider more time to learn how to coordinate their body and communicate their meaning to their horse. But allowing forward movement, along with encouraging suppleness, can better help a tense or hot horse work out anxiety, worry or frustration. Like a valve on a pressure cooker, it's important to let steam out of the pot to avoid an explosion. If you allow the hindquarters to swing sideways while moving forward in a circle, you can more easily diffuse energy and safely direct where your horse goes rather than pulling directly back on the reins and bottling up all that tension for a potential outburst. As mentioned before, releasing the inside rein each time the horse crosses its hind legs is key to expediting the suppling process and helping our horse learn how to relax even when - or especially when - they are in an excited or agitated state. This doesn't mean that you shouldn't grab the inside rein into a turn if you don't have the experience or wherewithal to manage that release when your horse is trying to bolt. Holding the inside rein while winding a circle down can stop a horse when needed, but it's helpful to be aware that it also "sticks" the inside hind leg into the stop and allows them to brace into the rein. Practicing in calmer moments allows you to briefly release the inside rein after using it to initiate a turn into a circle, then using the rein again to stay in the turn, followed by another release, and so on throughout the circle. Your horse will soften more quickly because they will learn to seek the freedom from pressure you are offering, and you will gradually need less and less in order to direct them into a turn. This release is also important to prevent a chronic or mechanical bend in the neck only. Like a kink in a hose, too much chronic lateral flexion can inhibit natural alignment and forward movement so important to the suppling process (see figures 4 and 5 below). Figure 4 on the left-hand side above shows a true bend through the body. Figure 5 on the right shows a horse over-flexed, or "rubber-necking," which occurs when the bend is unevenly and chronically distributed to the neck rather than through the whole body. At the same time, brief moments of over-flexion can be used to help a horse let go of a brace in the neck and shoulder area. Once the horse is soft and yielding to the inside rein from the jaw back to the hind feet (meaning they can now easily cross while turning in each direction), the turn on the forehand takes this exercise a step further by requiring a higher degree of "straightness" and "throughness." To achieve this, the outside rein and inside leg are added - and here is where many of us dressage riders get into trouble. The tendency is to think that we can simply pick up the outside rein to straighten the neck and shoulder as we try to move the haunches sideways with our inside leg. But the horse, feeling the pressure of the added rein, slows down or stops. We then feel compelled to use more leg to keep our horse moving. Now feeling the pressure to move in two directions but also the pressure to "stop" because of the added outside rein, our horse becomes confused and doesn't respond to either. Interpreting their inaction as disobedience because "they know how to respond to my leg and my rein," we add a whip and/or spurs for back-up. In return, they might express a range of emotion in the form of head flipping, teeth grinding, tail wringing, hollowing of the back, 40 pounds of sudden pressure in the reins, bucking, rearing or, depending on their temperament, simply a refusal to go forward. Just "doing the movement" might feel more important in our quest to move up the levels. But not allowing our horses a place to feel at ease between the boundaries set by our legs and our hands means they will only learn to dislike what we're asking of them. To avoid this conflict, we can once again break things down into their simplest form. Before picking up the outside rein, the first step would be to spend some time introducing a sideways movement in response to the inside leg. We have to now consider that our horse needs to learn to discern that sometimes a leg pressure means forward, sometimes it means sideways, and sometimes it means both. ~ Yield the hindquarters laterally on both sides in response to the inside rein while maintaining an active walk. This article has dealt primarily with this part of the movement. ~ Yield the hindquarters laterally on both sides in response to the inside leg while maintaining an active walk. Their nose will remain tipped or flexed away from the direction their hindquarters are moving. ~ Yield the shoulders laterally on both sides in response to the inside leg while maintaining an active walk. Their nose will remain tipped or flexed away from the direction their shoulders are moving. 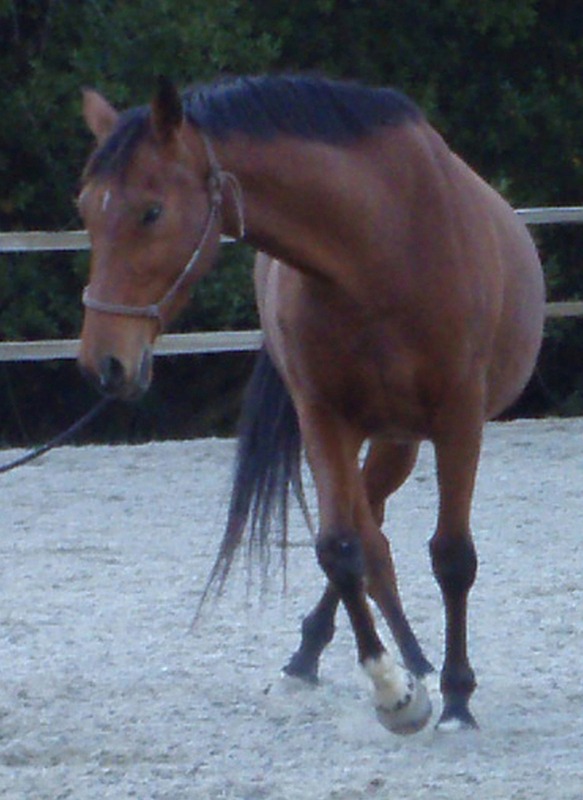 ~ Flex or turn the head to the outside using the outside rein while walking actively in a large circle. It can be confusing for the horse to walk in one direction while looking in the opposite direction, so the key is to start with small flexions. Again, the pressure of the rein directs their head to look to the outside, the release allows them to be soft and to relax. Taking our time with each directive is key. How well we get across what we want from our horse depends upon our experience, but also how well we communicate our intention. The timing of when we apply pressure with our reins and legs and when we release the pressure of our reins and legs is paramount and is dependent upon how well we can now coordinate several aids at once. If we allow ourselves plenty of time to learn to coordinate our various body parts, we will be less likely to blame our horse when things don't work out as planned. Taking the pressure off of ourselves is often the first step to being able to be in present time with our horse, along with being willing to observe what they need from us in order to understand what we are trying to communicate. Part II will look at various ways of preparing our horse to respond favorably to the use of the outside rein and inside leg, aids needed to go from "disengaging the hindquarters" to executing the turn on the forehand, a foundational exercise to the complex movements of dressage.